Premier Academy, Inc. is committed to utilizing best practices in early care and education to achieve the best learning outcomes for our children. As a NAEYC accredited and Quality Rated Center of Excellence, we implement research-based curricula and activities and exceed each of the state required standards in areas such as staff certification, in-service training and professional development, and infant to teacher ratios. In an effort to continuously improve our services offered to children and their families, Premier Academy conducts regular program evaluations and monitoring, as well as adapts our programs to reflect data obtained through this process and national and state studies in the field. Research indicates infant/toddler development occurs more rapidly during the first 24 – 36 months of development. During this time, infants and toddlers experience rapid brain development, physical growth, as well as dramatic growth in motor skills, cognitive and language skills, and social skills. This is a very exciting time for them, as they are experiencing their world for the first time. Premier Academy recognizes that children develop at their own pace, and it is our goal to create stimulating environments that support and encourages each child’s developmental milestones. Our staff performs daily observations and semi-annual formal developmental screenings using the Ages & Stages assessment tool to determine a child’s progress and provide recommendations to parents to support each stage of development. 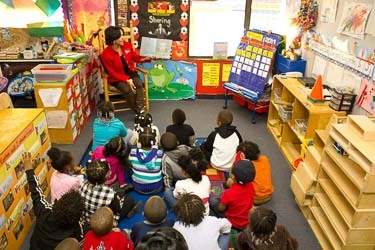 Premier Academy places emphasis on nurturing and age-appropriate stimulation. 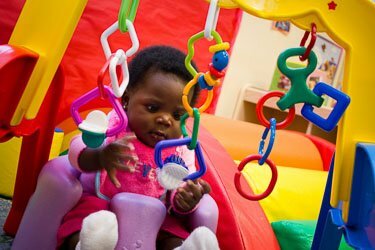 In our infant classes, babies are introduced to healthy social and emotional interactions, language acquisition, body awareness and motor control. 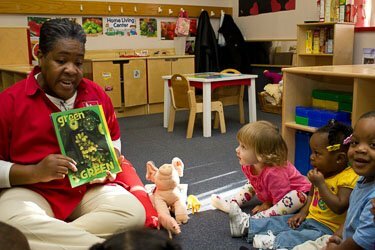 Teachers use daily, routine interactions with infants such as morning greetings, hand washing, diapering, feedings, sleeping, cuddle time, tummy time and other stimulating activities to maximize language, cognitive, physical and emotional development. Music, reading and sensory activities (i.e., water play) are also a critical component of the infant’s day. All activities are tailored to the child’s individual developmental progress. Toddlers are beginning to become more independent each day, and Premier Academy teachers are busy implementing strategies to nurture their new found curiosity. Learning experiences are designed to promote the toddler’s sense of independence, enhance social skills and build confidence in problem solving and self-help skills which are needed as the foundation for pre-school and beyond. Toddlers and preschoolers are involved in small and large group activities, individual classroom activities and outdoor play which allows them to discover who they are, socialize, learn to express their feelings, and begin to become independent, to feel comfortable and loved. Our teachers develop daily creative lesson plans that reinforce each child’s social, emotional, physical and cognitive development. 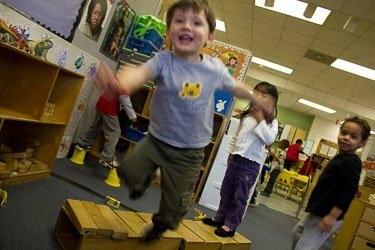 Preschoolers are more inquisitive, verbal and active at this stage, and improved hand-eye coordination creates opportunities to explore through jumping, climbing and running. Premier Academy teachers foster imaginative classrooms that nurture creative play, and verbal and social development. Preschoolers are involved in activities that encourage language development, critical thinking and problem solving and creativity.